OpenWorld If you think Oracle's only goal when it gained control of MySQL was to undermine it, Oracle has a message for you: Get over it. Speaking at the annual OpenWorld conference in San Francisco on Monday, Oracle chief corporate architect Edward Screven said there was never any question of the database giant mothballing MySQL. "Some folks felt that if Oracle acquired Sun, who had acquired MySQL, Oracle would not actually continue MySQL – that we would not apply the engineering resources necessary to maintain it, that we would try to kill it, that we would try to take the MySQL customer base and push them all over to Oracle database," Screven said. "This was a very mysterious concept to us." According to Screven, Oracle sees the MySQL customer base as being a very different group than Oracle database customers, with different needs. "At Oracle, if you talk to us, we're going to tell you we really believe in building full stacks of hardware and software that are engineered together," Screven said. "Now, that doesn't mean that we want one single technology at every level of the stack. It means that we want to solve all the problems that our customers have at each level of the stack. And in the database space, MySQL was an important way that we extended out our support at the database tier." Screven said Oracle has consistently invested in MySQL since acquiring it – and by "investment," he said, he meant payroll. Oracle has doubled the size of the MySQL engineering and support teams over the last five years, he said, and tripled the size of the QA team. That beefed-up development force has been hard at work polishing the MySQL code base, Screven said, improving its modularity, refactoring its core components, and increasing its scalability, with a particular eye to web-scale performance. 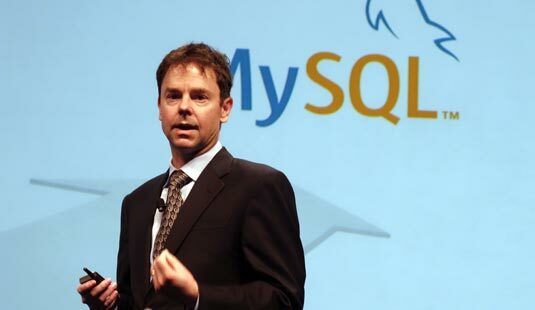 "Frankly, when MySQL came into Oracle, MySQL was a bit of a mess," Screven said. Screven was joined onstage by Tomas Ulin, Oracle's vice president of MySQL development, who said that the database, which has always been known for its speed, is faster than ever in its most recent releases. With the latest MySQL 5.7 Development Milestone Release, Ulin said – which was released on September 25 – the open source database can now process 645,000 SQL queries per second and more than 1 million NoSQL queries per second. It can also handle 67,000 connections per second, a boon for connection-happy web applications. Similarly, he said, the first Development Milestone Release of MySQL Cluster 7.4 improves performance by as much as 50 per cent, "depending on what you're looking at." Oracle has also added support for MySQL to its Oracle Enterprise Manager console, which lets admins auto-discover MySQL servers, configure them, and monitor their performance and availability from the same tool they use to manage Oracle databases. In all, Screven said, the nay-sayers who thought Oracle would torpedo MySQL need look no further than the latest version of the database to see that they were wrong. "If you look at what we've achieved over the last five years, in terms of product releases, product functionality, and product quality, I think the last few years of MySQL have been by far the most productive in its entire life," Screven said.